The Dell Quay boat company (pronounced "Dell Key") made a 13-foot boat, the Dell Quay Dory 13, that looked very much like a Whaler. An English company, they had a boat building and marketing operation in the United States and had their own registered MIC Code, DQU, which was listed as Dell Quay U.S.A. Ltd. That MIC code now points to BOSUN MARINE MARKETING, 2703 NW 29TH TERR, FT LAUDERDALE, FL. It took some research to find the proper spelling, i.e. "Dell Quay" versus "Del Quay", as many online sources were available in either form. I did manage to find a photograph of a recent boat and from the decal on the side settled the question in favor of "Dell Quay" which I use hereafter. The model shown below is often cited as a Dory 13, but I don't have this on great authority, and dealer's in the United Kingdom now have a similar looking boat that they market as the Clubman 13 or Mediterranean 13. In this case the boat was represented as a Whaler and sold to Mark as such. 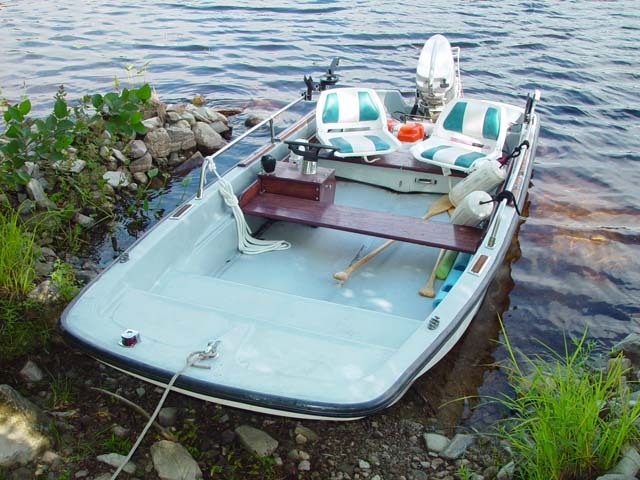 He was disappointed to find he had bought a Dell Quay instead of a real Boston Whaler, but the boat is in very nice shape, and has proved to be a good little boat in its own right. The hull lines are very similar, perhaps a direct splash from a Whaler, and the construction method is presumed to also mimic the foam-filled Whaler Uni-bond technique. I thought it interesting to show the Dell Quay Dory 13 so that the several differences in the hull, cockpit, and general fitting out would be apparent. Even with a set of bogus decals, it should possible in the future to easily distinguish a Dell Quay from a Boston Whaler. Information on Dell Quay was rather sparse on the world wide web, and if anyone has any more details on where and when these boats were sold in the United States it would be great to have that information and to add it to this article. I did check with Boston Whaler, and no one there recalls any cooperation or agreement between Dell Quay and Whaler taking place back in the 1970's and 1980's. The Dell Quay look alike, in their opinion, was likely a splashed hull. 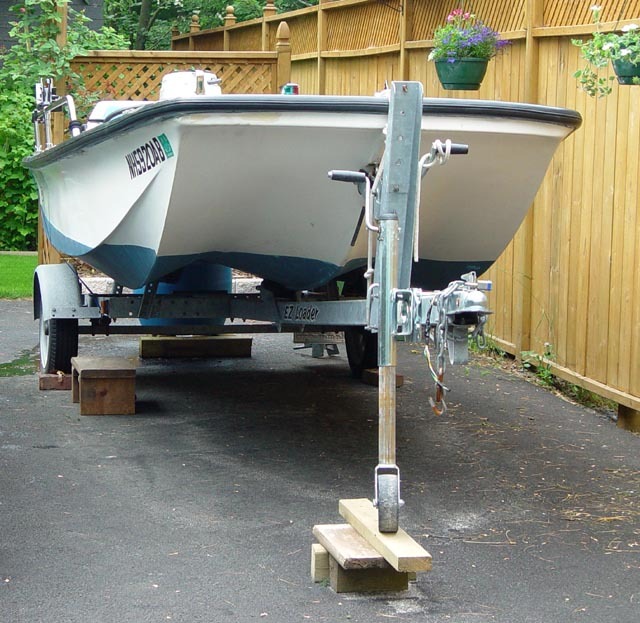 The application of a set of decals turned this Dell Quay into a Boston Whaler 13-Sport in the eyes of an unsuspecting buyer. 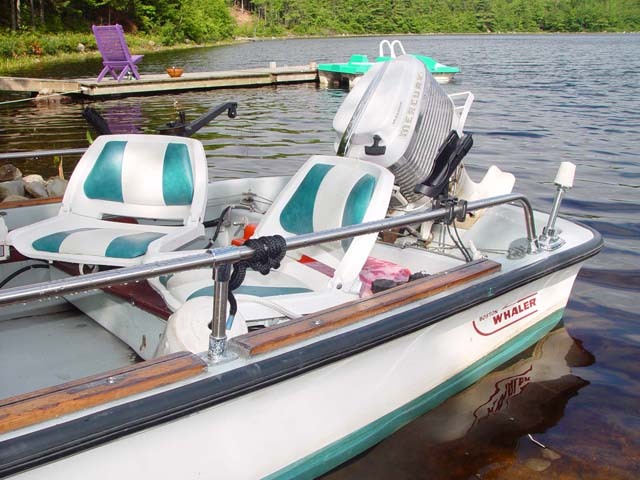 The rounded corners at the transom and the fitting of the rub rail are notable differences from the classic Boston Whaler 13-Sport model. Also, the absence of the "green line" joint between the hull and cockpit shells along the top rear edge of the transom--a trademark of authentic Boston Whaler construction--is clearly missing. 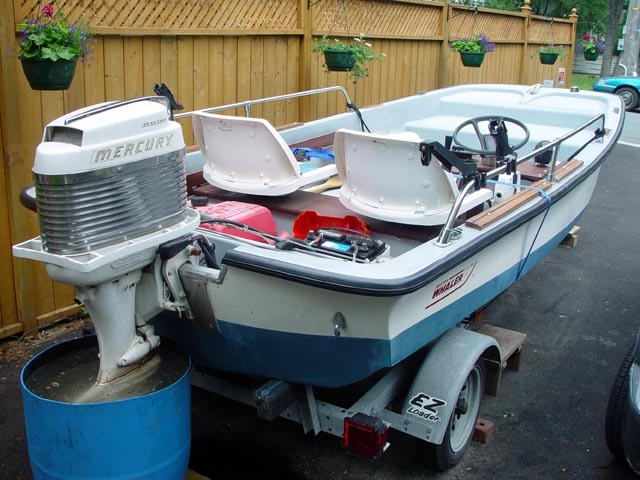 The classic 1962 Mercury 35-HP outboard is authentic; I hope it runs as well as its appearance suggests it should. Like older 13-foot hulls from Boston Whaler, the Dory 13 does not have the "smirk" shape to the bow. We don't know if all Dell Quay's had the bow navigation light mounted off center, but this one does. There are also cleats mounted on the gunwales near the bow, another deviation from the Whaler. The cockit mold has a very different shape in the bow. 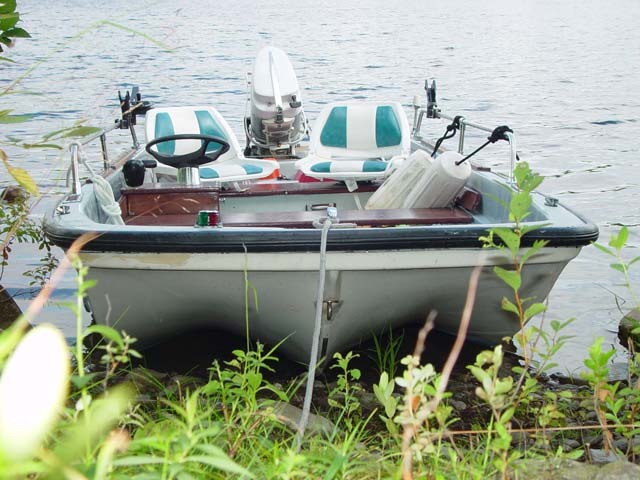 The use of blue gel coat in the interior makes confusion with a Boston Whaler more likely. The gunwales are capped with wood boards, a technique which was not seen in the 13-foot Whaler original. The rub rail is black, but on older Whalers was white. The wide one piece rub rail was changed to a three piece configuration with a removable rubber insert to facilitate easier replacement on real Whalers built after c.1972. The mounting of the stern navigation light is on the gunwale on the Dell Quay; on the real Whaler it mounts inboard on the transom. The wire rope and pulley steering is similar to older Whalers. 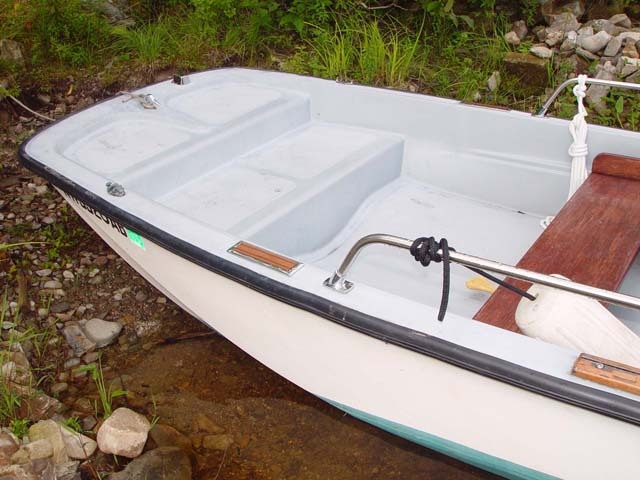 The wooden thwart seats and small side console are very similar to the Boston Whaler. The rear seat appears to have a molded drawer under it. This view shows the blue gel coat in better lighting. Also, a tip of the hat to Mark for the excellent photography. I didn't change a single bit of the digital images he sent. They were all well composed, well exposed photographs that showed many details. Thanks for making it easy, Mark. The page has been accessed 56852 times. This article first appeared March 30, 2003.